The minutes of the previous meeting were agreed as a true record. There were no matters arising which were not otherwise on the agenda. JS reported that correspondence continued to be received from Civic Voice and offered to circulate this to any members who wished to receive it. DW reported that the Society has £40.11 cash in hand and £257.22 in the bank making a grand total of £297.22. There were not outstanding cheques for payment so this represented a true picture of the Society’s resources. TL could make it to the meeting as he was preparing for the public meeting to be held at 7.30pm at Hawbush Primary School. LM updated the meeting on the situation with regards to clean power. It appeared that the environmental impact of the site could be considerably greater than had previously been anticipated. This was because it had now transpired that a condition of the use of the site was that a freight rail terminal also had to be built. This meant that even more heavy vehicles would be moving to and from the site. Additionally more waste could be brought in from around the country, so the amount of waste to be processed was likely to be considerably higher than previously stated. It was also noted that the revised planning application had included some revised air locks to try and counter any odours from the plant, but other than that the application was substantively the same. The local authority is revising its regeneration strategy and SNOW were advocating that the Moor Streets sites should be re designated as areas for light industry and housing. This would be in line to the wider change to residential use in the area. The Society discussed how best to support SNOW in its opposition to the proposals and unanimously agreed to write in support of SNOW’s submissions to the planning authority. TS read out a letter from Angela Wasely who is a leading member of the Fens Pool and Buckpool Wildlife Group. A planning application had been received to develop a site on the Leys Industrial Site for aggregate waste. Further investigation had revealed that initially local authority officers had failed to identify the high risk of noise and dust from the site. In the event the applicant had commenced operations before receiving planning consent and the negative consequences had been demonstrated. There was now a recommendation to oppose the application. It was agreed that the Society should also oppose the application. A more general discussion took place regarding the number of applications for development in the area which would adversely affect the amenity of local residents. It was felt the Society had a role in having a watching brief on planning matters and DW kindly agreed to monitor applications on a weekly basis and raise any issues which would be of concern. The offer was gratefully accepted by the meeting. TS and DW spoke about a meeting which had taken place in August with officers of the local authority regarding the condition of the memorial. James Ball of Wordsley School had joined the meeting. The school had indicated that it had wanted to adopt the memorial as part of its World War One centary activities. The memorial is generally in good condition. The most vulnerable material was the Sicilian marble which was used to depict a scene on each side of the memorial, for the statue of the soldier, and for the decorative pillars on each corner. The western facing marble was eroded quite badly, whilst parts of the soldiers helmet had disappeared. There were various options on how to go forward. The marble could be coated to prevent further deterioration; or the most eroded scene could be replace (but what would happen to the original); or interprative information could be supplied. Each of these raised issues in themselves and a futher question was who should decide what should be done. 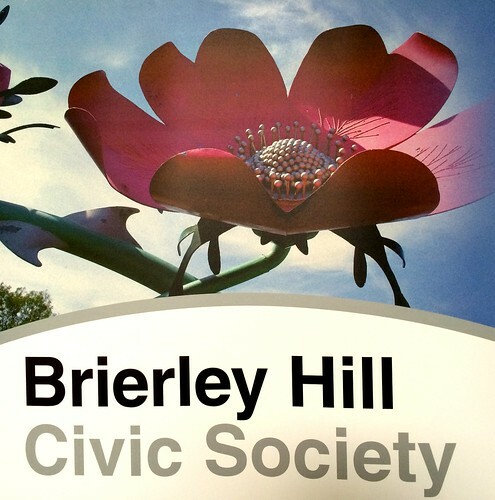 When the memorial had first been mooted Brierley Hill had held a town meeting so that all residents had an opportunity to contribute their ideas. The memorial itself had been built by public subscription. It was therefore felt that a ‘town meeting’ should be organised to try and get a wider opinion on which option to take. The meeting needed to be well publicised. TS agreed to make the arrangements. DW reported that the council’s engineers had now identified funding to enable the lights on the wall fronting Church Hill adjacent to the memorial to be restored as part of the ongoing repair work. TS gave a progress report. A further bid has been submitted to Community First to expand the scheme further along the High Street. However, the fund is now over subscribed so it may be that other sources of funds such as Ibstock Corey will need to be approached. The present plants will be removed in early November, new plants will be put in place and will grow in situ. Hopefully another splendid display will be achieved for next year. Discussions are taking place regarding the council’ planters outside Mecca Bingo. These are in a very poor state. It was pointed out that no other town centre in the borough had been neglected like this and there was a strong feeling at the meeting that Brierley Hill should be treated on the same basis as other towns. JC reported that substantial bulb planting will take place at the Church Street side of the church. Some 3600 bulbs will be planted as part of St Michael’s 250th anniversary. Unfortunately it had not been possible to arrange for the meeting to be hold at the former Royal Brierley Buildings as the conversion to homes was nearing completion and access would be difficult. The Society welcomed the preservation of the buildings and the new use which had been found for them. It was agreed to investigate architectural awards which are available and to nominate this scheme for one accordingly. If nothing suitable could be found the. Thought could be given to created our own award. The West Midlands MASA had invited the Society to take advantage of free membership. MASA is recognise by Civic Voice and enables Civic Societies to coordinate activity and information on a regional basis. It was agreed to join MASA. JS reported on the emerging arrangements for the Christmas Festival which will take place in 6th December. JC informed the meeting if the excellent news that the Christmas Tree festival would be launched in the same day and St Michael’s would also be holding a drop in event on the same morning. JS commented on how well this complemented the other plans for the day. Concerns was expressed about possible reductions in the council’s maintenance budget for Marsh Park – especially sensitive in the centenary of the Great War for which the park formed part of the memorial. SD raised the issue of the state of repair of Lawyers Field and the blocking off of access from the Church Street end for ‘health and safety’ reasons. The feeling of the meeting was that Brierley Hill seemed to be suffering disproportionately from the cutbacks compared to other town centres. It was agreed to invite councillors to go on a walk to identify key issues which needed to be addressed. In a more positive note, DW report reported that further planting work will take place through Friends of Marsh Park. JC told the meeting that St Michael’s had won funding to plant 3600 daffodils at the Church Street side of the church yard as part of the 250 the anniversary celebrations in 2015. The meeting discussed rumours circulating in the town with respect to ASDA.